Feedback is vital for successful creative projects. If you don’t know what your clients are thinking, you’re in trouble. 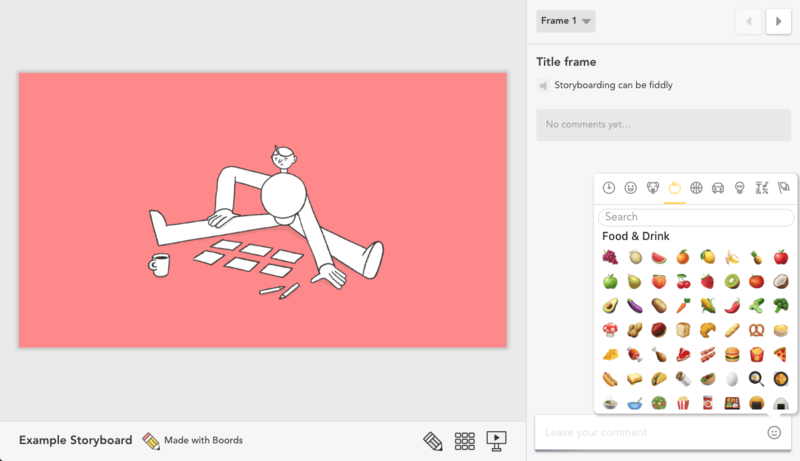 We’re constantly striving to help you to get meaningful feedback on your storyboards. That’s why the latest Boords updates are all about comments. Let’s take a look. It can be difficult to make sense of feedback on complex storyboards. Our new Comment Replies feature makes it simple. Whether you’re editing a storyboard or sharing it with a client, Replies let you nest new comments under existing ones. Comment Replies are available on all Boords plans. Your clients can even leave Replies without needing to sign up for a Boords account. Have you ever wanted to give your comments some emphasis? Now you can, with our recently released support for Markdown. Add italic text, bold text and links to your comments with just a few keystrokes. But sometimes going bold isn’t enough. So, we’ve added an emoji picker to the Comments field too. Just click the smiley face and find your favourites.